Fair Play Lodge No. 132 AFM will be selling smoked Port Butts for $40 at the Lodge, 710 Hwy 182, Fair Play between 11:00am and 2:00pm. Tickets can be purchased from any member of Fair Play Lodge. Pacific Lodge No. 325 BBQ Fundraiser will start at 11:30 and goes until 4 PM and the cost is $9.00. Blue Ridge Lodge No. 92 AFM will hold their annual Yard Sale beginning at 8:00am in the Lodge's parking lot adjacent to the Walhalla Post Office. Come out and find some new treasures. Persons wishing to donate items for the yard sale should contact SW Marty Wright at tmartwright@gmail.com or (864)419-5148. Coin selling to raise money for the Grand Lodge Disaster Relief Fund and the Scottish Rite Foundation. Coins are $10 Each. For information contact RWB John Marcucci at 803-920-8089. Recovery No. 31 AFM is celebrating the 200th year since its founding by offering 1.5 inch (1 troy ounce) fine silver coins for $40. Nickel coins are also available for $10. The silver coins come in a beautiful felt jewel box. Shipping is $4.00. Make checks payable to Recovery 31 AFM PO Box 1432 Greenville, SC 29602, or contact SW Richard Moore R.moore@infor.com 864 414 2950. Stonewall No. 124 AFM is ​celebrating its 150th anniversary this year. We will have a lodge rededication on November 18, 2017. We are selling these coins for $10.00 plus shipping. Coins are 1.5” antique brass. To order email tomlove@wctel.net. 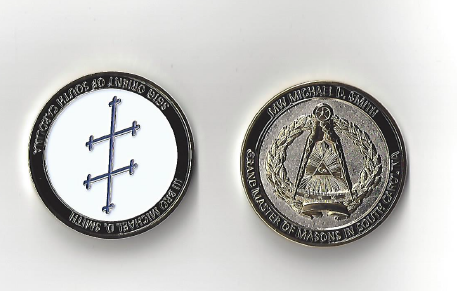 St. John's Lodge No.333 AFM has the following coins and pins for sale. Please contact WM Dale if you want one of them. Past Grand Master William Longshore Coins $10.00, 250th Anniversary Coins $10.00 and 250th Anniversary Lapel Pins are $5.00. Shipping will be extra. St. John's Lodge #333, A.F.M. The 18th Masonic District of South Carolina has a coin for sale, commemorating the 75th Anniversary of the Rock Quarry Degree. $10.00 each, while supplies last, limited quantity. The Annual Rock Quarry Degree is hosted by Cooper Lodge No. 282 AFM of Travelers Rest, South Carolina. Spartan No.70 AFM is selling this coin and pin for a fundraiser. The coins are $10.00 each and the lapel pins $5.00 each. All inquiries should be directed to WB Judd Seay, Secretary Spartan 70. This can be a lasting tribute to a dear departed family member or just a statement of when you became a master mason or the organizations to which you belong. Whatever you want to put on your BRICK is your choice. Brothers, here is the chance to make a lasting memorial to your mother, father, grandmother or grandfather or some significant mentor of your Masonic journey.